Most of the animal and plant species that share our world do not make a nuisance of themselves. Many are beneficial, such as ants and termites, when they do not interfere with human property and activities. In fact, less than 1 percent of all species are pests that negatively affect our lives by invading our space, damaging our property and threatening our health. 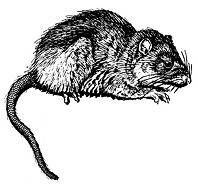 Rodents (rats and mice) annually consume and contaminate about 20 percent of the world’s food supply. Without pest control, half of our food might be destroyed by crop and stored product pests. Rodents also do untold damage to property – their gnawing is a suspected cause of fires attributed to unknown causes. As for insects, termites alone cost Americans about $1.5 billion each year in damage repair and control – more than the combined cost of all natural disasters. Pest tolerance in crop land is usually based on the cost of control. Sometimes pests can be numerous and do considerable damage to a crop before the cost of that damage outweighs the cost of control. However, we are less tolerant of pests in the urban environment. Most of us are very concerned upon finding insects living with us, so much that the presence of a single cockroach or flea will prompt pest control in the home. Structural pest control decisions are sometimes based more on emotion than economy. After all, fear of arthropods (insects, spiders and their kin) is our third most common fear (behind public speaking and heights), and spiders are the second most feared animal (behind snakes). While fear, often unfounded, can sometimes be the stimulus for initiating pest control services, some pests do pose a very real threat to humans. Health concerns associated with structural pests include venomous stings and bites in addition to the transmission of diseases including food poisoning, allergies and Hantavirus pulmonary syndrome. Pests also can have a psychological impact on us, for example, from the unsettling feeling of knowing (or suspecting) you are living with insects, spiders, rats or mice. If you’re concerned about pests in your home or business, you are not alone. In the United States there are more than 18,000 pest management companies waiting to help you. Whether you employ one or prefer to do it yourself, your first step should be to get information. The Internet may be a seemingly boundless, sometimes questionable, source of information on pests and control. If you take this route, look for reliable sources such as Web sites offered by university extension services, and state departments of public health or agriculture. Their Web sites and specialists can help you identify your pest and suggest control methods. Before treating a pest infestation, identify the pest involved, and inspect to determine the nature and extent of the problem. Whether you’re a do-it-yourselfer or a pest management professional, this information is necessary to determine the best methods to use to control the pest. Without knowledge of a pest’s identity, characteristics and level of activity, you’ll be applying control measures blindly instead of finding the right one for the job. Pest control is like visiting the doctor: To prescribe effective treatment, your physician must correctly diagnose the problem, and determine the extent of the injury as well as the potential for further injury. The doctor must then use this information, along with knowledge of applicable treatments available for that particular condition. He/she must then consider which treatment(s) is best. In pest control, we call this process Integrated Pest Management (IPM), the foundation of successful pest control. Using IPM, we first identify the pest and gather information about the infestation. Then we choose the best method(s) of control for the situation, after considering the safety, effectiveness, environmental effects and cost of each method. In many situations, pesticide application may be the best method. In other situations, non-toxic methods such as trapping, sealing food and reducing moisture can be used more effectively than pesticides. More often, several types of chemical, mechanical, and environmental methods are used in combination, i.e., integrated, to produce the best results. What is your tolerance for pests? for pesticides? For any pest situation, selection of the best methods will vary not only with type of pest and nature of the infestation, but also with the individual who decides which methods to employ. Repair leaky roofs, faucets, pipes and appliances. Direct water away from the house. Eliminate standing water and water in outdoor containers. Ensure that crawlspaces have vents and a vapor barrier. Seal foundation cracks, and gaps where utility lines enter. Keep doors, windows and vents screened and well sealed. Keep exterior wood painted, stained or sealed. Seal items in storage. Store items in plastic, not cardboard. Before bringing in new items, inspect them for pests. Keep trash containers clean and tightly sealed. Keep foods in sealed containers. Don’t leave dog/cat food or birdseed out for long periods. Remove clutter and junk, indoors and out. Use gravel or rock instead of wood mulch. Use concrete or plastic instead of wood landscape timbers. Keep plants trimmed and woodpiles away from house. Use yellow “bug lights” in exterior light fixtures. Use snap traps for mice and rats. Use sticky traps to locate and control insect/spider infestations. Use pheromone traps for clothes moths, meal moths, etc. Use light traps indoors for flies, etc., flypaper and swatters too. Use a vacuum to remove ladybird beetles, fleas, spiders, etc. Some of the methods above take more effort than others, some cost more, but all are important parts of your pest management plan. In many cases, one or more of these is enough to eliminate pests. Household pests for which non-chemical methods are best include most “pantry pests” (flour and grain beetles, meal moths, etc.) most types of flies, and fabric pests (clothes moths, carpet beetles). The adoption of IPM has brought with it a surge in non-chemical methods of managing pests. But beware of advertising claims. Some devices are not very effective or completely ineffective at controlling pests. These include any one of the many devices said to control pests by generating sound or electric/magnetic fields. Independent research has found that these devices do not control pests. Another type of device, outdoor electrocuting light traps, indeed attract and kill insects – but mostly beneficial insects instead of the mosquitoes they target. These traps should not be confused with other types of light traps that do help control flies and other insects indoors. Once flies get inside structures, light traps can help control them. If your pest situation requires chemical control it is important that you consult a credible source to help determine which pesticide is right for the job. Once this is determined, you should READ THE LABEL. 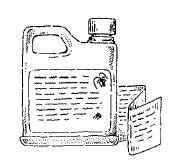 A pesticide product’s label is a legal document. You do not need a license or certification to apply most types of pesticides on your property. But whether you’re a homeowner, grower, entomologist, or pest control service technician, you must follow label directions. Any deviation from label directions is a violation of federal law. So before applying any pesticide, please read the entire label and follow the directions. Do not forget to wear all protective equipment required by the label. Depending on the product, this can include a long sleeve shirt, long pants, hat, rubber boots or shoe covers, unlined gloves, eye protection and a respirator. And, if you have questions about a pesticide label’s directions, how to apply pesticides correctly, or about the licensing, certification and regulation of pesticide applicators, you may wish to contact the Illinois Department of Public Health at 217-782-5830 about pesticide application indoors, or the Illinois Department of Agriculture at 217-785-2427 about pesticide application outdoors. The selection and proper use of pesticides is your responsibility. All pesticide applicators must assume responsibility for, and are liable for, their actions. Understandably, many people do not want this responsibility, and/or do not or cannot invest the necessary time, effort and expense. Moreover, control of some pests, such as termites, can be labor-intensive, complicated, and best left to professionals. Each year about three-quarters of U.S. households use pesticides. About one in every five households hires a professional, that is, a person employed by a commercial pest management business. It is no longer correct to think of these individuals as the “bug man,” as “sprayers,” nor even as “pesticide applicators” or “exterminators.” Today’s pest control, or pest management, is much more than that. A properly trained pest management professional possesses the level of knowledge required to solve your pest problems. Today, the concept of IPM – with its emphasis on identification, inspection, and selection of the best methods in each situation – replaces the routine spraying of baseboards and other surfaces. Today, many consumers are not paying for “spraying,” nor do they want routine pesticide treatments. While most homeowners do not know what IPM is, most say they would pay more for pest management that controls the pest using less pesticide or no pesticide at all. After all, anyone can spray baseboards, including homeowners. But few people have the knowledge required to control every type of pest in every situation. How do you find a good pest management company? And once you have one, how can you tell if their service is appropriate? Some pest management companies advertise their company’s longevity. Certainly being in business for 50 years does not necessarily mean the company will manage your pests effectively. Newer companies can have personnel who are just as experienced as those at long-established businesses, just as local companies can have technicians as experienced as those working for national or international companies. Likewise, you should carefully consider any references a company provides. Almost every company has at least a few satisfied customers. It’s better to bank on independent referrals from friends or acquaintances that have contracted the company’s service. You also may want to investigate any complaints against the company, filed at your local Better Business Bureau or Consumer Protection Office of the Attorney General. In the end, the measure of a company is in the quality of its employees -- especially those employees that will be servicing your house. Most pest management companies offer free inspections. This is a good thing. It enables you to call one or more companies to send an “inspector” (often an inspector/salesperson) to inspect your home for pests and for conditions conducive to infestation. A knowledgeable and experienced inspector can provide you with valuable information, not only about pests, but about your home and what you can do to prevent pest infestation. It’s always wise to get a second opinion, so don’t hesitate to call two or more companies for free inspections. You’ll probably learn a lot, not only about pest management, but also about the quality of each company’s personnel and how it operates. This initial in-person contact with a prospective company, is very important. Think of it as a doctor’s house call, but also as a job interview. Do not hesitate to ask questions. You might learn something, and you will be testing the inspector’s knowledge. Take notes if you wish. They can you help later to check the inspector’s answers against information from other sources. What are the expected results? Reduction or elimination? How long do you think it will take to solve my pest problems? What pesticides will be applied? Can I have copies of their labels? How many of your technicians are certified by the state agency? Will the technician servicing my house be state certified? How much experience does that technician have? Does the company offer a guarantee? What is your cancellation policy? Can the inspector answer your questions? Did he/she fully explain everything about the proposed service? 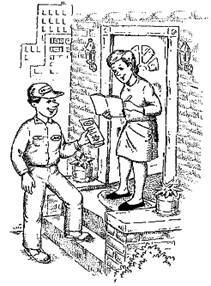 Did the service details seem vague or generic, or specifically designed to solve your pest problems? Also, did the inspector seem to be in a hurry? Did he/she pressure you to act quickly? Termites, for example, consume wood very slowly, so there is plenty of time to make an informed decision. Only in situations where pests pose a threat to human health is there an immediate need for pest control. Watch and listen. Pay attention to the details. Was the inspector on time? Did he/she appear professional? Was their vehicle clean and in good condition? Was the inspection thorough? Did the inspector check all areas of the house? Did he/she show you and explain their findings? Was he/she familiar with IPM? Unfortunately, the first thing that influences most consumers deciding on a pest management company is price. As with other types of services, pest management is one where often “you get what you pay for.” Yes, you should consider hiring the company that offers the lowest price. It might be the best value. But price should never be the primary factor governing your decision. A low-priced company may not be charging you enough to cover the cost of using the best materials or of spending enough time to get the job done. In contrast, a company quoting a relatively high price may be overcharging for their services. Again it’s in your best interest to call several companies and compare. In many cases, yes, but only if you are willing to invest the time, effort and expense necessary to gather information and do what’s necessary to solve your pest problems. Again, anyone can spray pesticides, but pest management often involves much more. Control of some pests, such as bees and wasps, may be too dangerous for you to risk doing yourself. Other pests, such as termites, require specialized knowledge and equipment, and are best left to professionals. IPM is Integrated Pest Management, the basic premise of pest control. Its goal is not to reduce or eliminate the use of pesticides. The goal of IPM is to control pests; by using the best control methods after carefully considering each method’s safety, effectiveness, cost, and effect on non-target organisms and the environment. Shouldn’t all the baseboards in my home be sprayed? No. This used to be the standard practice of pest management technicians but it is generally ineffective and needlessly exposes people and pets to pesticide. Pests occasionally live behindbaseboards, rarely inside them, but never on them. So rarely is there a need to spray baseboards. If pesticides are to be applied, they should be applied to the cracks, crevices and voids where pests spend most of their time. If I want ongoing, periodic service, what should the service consist of? Once any existing infestations are brought under control, most of your service technician’s time should be spent inspecting for pests, not chatting with you nor applying pesticides where there are no pests. When the technician’s inspection discovers evidence of a pest problem, he/she should determine the best methods to use, then apply those methods. What frequency of service is best? That depends on your situation and the type of pest involved. Some pests can be controlled by a single service. Others may take months, or even longer. Once your pest problems are eliminated, you may opt to retain periodic service, but that service should focus on inspection and spot treatment of pests if and where they are discovered, rather than routine pesticide application. Are pesticides always necessary to control pests? No! 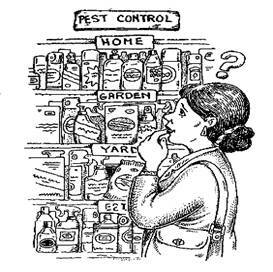 There are many pests that can, and should, be managed quite successfully without pesticides. Many others can be managed by using only pesticides with less toxic active ingredients and formulations such as baits, dusts, and microencapsulate pesticides that present less risk of human exposure. Are pesticides safe? What about pregnant women, children and infants? No chemical substance is absolutely safe. The U.S. Environmental Protection Agency (EPA) registers all pesticides, after assessing that each presents tolerable risk when used according to label directions. Any use inconsistent with a pesticide’s label is a punishable violation of federal law. In general it is the misuse, not the use of pesticides that is hazardous. The EPA recognizes that risks associated with pesticide exposure may be greater for pregnant women, children and infants, and takes this into account when registering pesticides. If you’re concerned about these risks, have your physician review the labels of pesticides that will be used in your home. Which is best for termites: baits or liquid treatments? That depends on the structure, and on you. Both baits and liquid treatments will protect structures from termites. Some baits work better than others, just as some liquid termiticides work better than others. Unlike liquid treatments, baits must be checked periodically. Liquid treatments can be more invasive, however, and may require floors and walls to be accessed and drilled so that termiticide can be applied to the soil below. Are all termite control guarantees the same? Pest control companies generally recommend that consumers pay an annual fee after a structure is treated for termites. Essentially, this fee continues the terms of the original contract and can be thought of as “termite insurance” that usually obligates the company to retreat the structure if termites reappear, and in some cases to repair subsequent termite damage at no charge to the customer. 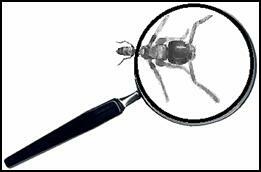 Annual inspection of the structure, performed by qualified pest control personnel, is also recommended. How long do liquid termiticides last? Again, it depends on the product, soil conditions, and the quality of application. To obtain EPA registration, today’s liquid termiticides are required to protect the structure for at least five years. Some can last much longer. How much should pest control service cost? The best way to determine this is to compare estimates from several companies. It can be unwise to hire the company offering the lowest price, because there are many other factors to consider. In addition, each of us is unique in our tolerance of pests, pesticides, and prices. Again, the more information you gather, the easier it will be to decide if the price is right. The technician told me some things I need to do – what am I paying for? You’re paying for the technician’s knowledge and service. If you’re dissatisfied with the service, tell your technician. Part of his/her job is to advise you of improvements you can make around the house to help make it less hospitable to pests. Whether you take that advice is up to you, but good pest management often requires cooperation between you and your technician. If you cannot personally do the things your technician recommends, you might hire someone else to do it. Who can I call if I suspect my house is not being properly serviced? First express your concerns to the technician who provided your service. If you’re not satisfied with the technician’s response, call the company. If issues still cannot be resolved, you can contact the Better Business Bureau, Attorney General’s office, or the agency that regulates structural pest control in your state. Who do I call if someone is accidentally exposed to pesticides? First call the Poison Control Center in your area (800-222-1222 in Illinois). It’s best to have the name of the pesticide involved, so you can inform the Poison Control Center, emergency medical technicians, and your physician. If you do not know the name of the pesticide, the technician or their company should be able to tell you, and/or you can check the service reports they gave you after each treatment – always save these reports! They are required to show what pesticides were used. Follow the Poison Control Center’s instructions. NOTE: When pesticides are used, it is the applicator’s legal responsibility to read and follow directions on the product label. Not following label directions, even if they conflict with information provided herein, is a violation of federal law. For more information, contact the Illinois Department of Public Health, Division of Environmental Health, 525 W. Jefferson St., Springfield, IL 62761; or call 217-782-5830, TTY (hearing impaired use only) 800-547-0466.